We’d love your help. Let us know what’s wrong with this preview of Saffy's Angel by Hilary McKay. Caddy is the eldest. She's on her ninety-sixth driving lesson and she's mad about her gorgeous instructor. Indigo is an outrageous cook and survives as the only boy in a pack of girls. Rose, the youngest, is a whiz at art, and knows just how to manage her parents. To ask other readers questions about Saffy's Angel, please sign up. Saffy's Angel is poignant and hilarious, and very, very British, and absolutely fabulous. I don't quite know how to recap it without ruining the constant surprise of the humor, but why don't you meet the characters? Rose was still awake, late though it was. She was painting a desert landscape on the white wall of the landing. She had got rid of her father very successfully when he telephoned. Saffron had hardly been mentioned; the discussion had been all about art. The desert landscape was the direct result of her father's telling her to start small and stick to painting only what she knew. "I will say I want to take my beanbag," said Sarah, ignoring Saffron's squeaks on the phone. "I often take my beanbag on car trips. It's enormous and you're not very big. I'll empty it out and cover you in the cover and pile a lot of stuff around, and they'll never notice. They're used to me having a lot of stuff. As you know. What do you say?" "Goodbye," said Saffron. "You have obviously gone mad." There's Caddy, of the debatable driving skills and immersive studying techniques and love of guinea pigs. She's quirky and individual, a quintessential Casson, but also a recognizable teenager, and I wish she was in the story more. And, of course, there's Saffron, the Saffy of the title, who isn't on the Casson color chart. Who meets Sarah, the girl next door, and finds out that maybe Eve isn't just messing around painting in the shed.Who is willed a stone angel by her grandfather - a stone angel that is missing. I haven't even mentioned the adults yet - Mr. and Mrs. Warbeck! Peter the taxi driver! The dysfunctional parenting duo of Eve and Bill! Michael the driving instructor! Saffron didn’t know she was adopted until she couldn’t find her name on the paint color chart in the Cassons’ wonderfully disorganized house. Even though Eve and Bill Casson, her aunt and uncle, treat her as one of their own children, Saffy feels left out--until her grandfather’s will reveals a legacy she’d almost forgotten, a stone angel from her old home in Italy. But this doesn’t begin to touch the intricacies of the plot or the depth of characterization or the sheer craziness of it. Every character we meet has a wealth of story bursting off the pages, from Caddy who keeps failing her driving lessons so she can keep the attractive instructor Michael from leaving, to Saffy’s best friend Sarah who never stops pushing Saffy to find out what happened to the angel, to Bill and Eve’s weird and probably dysfunctional relationship and parenting styles (though you don’t quite get to hating Bill in this book--give it time). Although Saffy’s angel forms the core of the plot, there’s so much else going on that it’s really more a story about family—not just the ones we’re born to, but the ones we make. There’s a moment early on when Michael observes Caddy, Indigo, and Rose waving madly out the window at him and feels a pang that he can’t be part of it; I can’t say I want to be part of the Casson family, but I love the way they care about each other so fiercely. I find it very strange that my library shelves the Casson Family books in the middle-grade section, because despite the youth of some of the characters, it strikes me as appealing more to an older crowd, particularly in the way the story is told. Hilary McKay seems to specialize in these stories that don’t have a plot so much as an organic growth of events. Saffy’s Angel darts here and there, touching on the different things the Cassons care about (Indigo’s obsession with polar expeditions, for example, or Rose’s stubborn certainty that she is right about everything to do with her art) and then moving off to touch on something else—and yet always coming back to earlier points until, at the end, you discover this (view spoiler)[Caddy, Indigo, and Rose’s insane journey to Wales to find Saffy’s angel (hide spoiler)] was where the whole thing was going all along, and even the things that didn’t seem important early in the story turn out to be key to that final decision. I don’t know if this kind of writing works for everyone, but I find it fascinating, more so when I read the book again knowing what’s going to happen. Saffy’s journey is like a bright little arrow moving straight through the tangles of everyone else’s actions, and what makes it wonderful is that McKay doesn’t feel the need to hammer home any points about belonging and family and identity; Saffy doesn’t have any realizations about how this really is her family and there’s no big Message. It’s just clear at every moment in the story that Saffy does belong, and Saffy knows it too. Even so, I always cry a little at the ending (view spoiler)[When Caddy repairs the angel, and makes it better than new, the book ends before Saffy sees it, so there’s no indication of how she feels about the gift. But I like the thought that the angel, at that point, doesn’t represent Saffy’s longing for identity; it’s a mark of how she’s a part of her family, and this is something any of them might do for each other. And I find that beautiful. (hide spoiler)] and at a lot of points in between, just like I laugh at Michael’s invention of Droopy Di the perfect girlfriend, and the guinea pigs, and Rose’s art projects, and the image of the Banana House they live in—laughter at the last because I don’t have to live in it myself. I love this book because it’s so many things all at once, and because it makes me happy. Saffy's Angel starts off a bit harrowing as the author drives you immediately into the world of a family afflicted with artism and associated dysfunctions. Fortunately, that first scene includes a walk-on by a woman who can be used to represent your every-day sensibilities and if you let her carry your own quibbles and expectations as she leaves, you'll be just fine. If you can't do this, there's no way to enjoy the book so you'd best stop there. Fortunately for those of us not tied too tightly t Saffy's Angel starts off a bit harrowing as the author drives you immediately into the world of a family afflicted with artism and associated dysfunctions. Fortunately, that first scene includes a walk-on by a woman who can be used to represent your every-day sensibilities and if you let her carry your own quibbles and expectations as she leaves, you'll be just fine. If you can't do this, there's no way to enjoy the book so you'd best stop there. Fortunately for those of us not tied too tightly to the expectations of reality, once you allow yourself to simply accept the world of the Casson family you'll find not only an entertaining read with delightful characters and outstanding personalities, but also a wealth of very human truth about love and family and integrity built from imperfection. Oh, and you'll also laugh yourself silly. At least I did. I'm actually, literally (and I use that word in its actual meaning) sore from laughing so hard. I just LOVE Hilary McKay. I have read Saffy's Angel several times now and it STILL makes me laugh out loud again and again--even when I know what's coming. The scene where the Casson kids drive to Wales--that's just got to be the funniest scene in a hundred years of writing for children. It's just genius. I also found myself really enjoying the excavation of the house. I say again: If more contemporary children's writers wrote like THIS, I would not be so bitter and twisted. I wish I wrote like th I just LOVE Hilary McKay. I have read Saffy's Angel several times now and it STILL makes me laugh out loud again and again--even when I know what's coming. I say again: If more contemporary children's writers wrote like THIS, I would not be so bitter and twisted. I wish I wrote like this. I wrote a critical essay for school on this, and it was labelled (by the teacher who hasn't read it) as "girly teen fiction", because it is not about war or best friends killing each other (although there are deaths, and best friends). Fiction? Yes. Teen? Maybe, although there is a massive variety of ages that enjoy this book. Girly? No. My brother enjoys this book. He doesn't like reading, but still he is working on getting through the rest of the series. Maybe people on Goodreads will apprciate I wrote a critical essay for school on this, and it was labelled (by the teacher who hasn't read it) as "girly teen fiction", because it is not about war or best friends killing each other (although there are deaths, and best friends). Fiction? Yes. Teen? Maybe, although there is a massive variety of ages that enjoy this book. Girly? No. My brother enjoys this book. He doesn't like reading, but still he is working on getting through the rest of the series. Maybe people on Goodreads will apprciate my essay more than my teacher did. 5. Choose a novel or short story in which you feel sympathy with one of the main characters because of the difficulties or injustices or hardships she or he has to face. Describe the problems the character faces and show by what means you are made to feel sympathy for her or him. “Saffy’s Angel” is a novel by Hilary McKay in which you feel sympathy with the main character, Saffron Casson, because of the difficulties she has to face. The novel is about Saffron, who tries to find a stone angel that was left to her in her grandfather’s will. She feels as if the angel is her last connection to her family, and overcomes many difficulties in order to find her angel. “‘You’re not my family,’ said Saffron. Eve explains that Saffron’s grandfather used to live with her, which gives Saffron hope because her grandfather is the only family member whose relationship to her has not changed. You feel sympathy for her, because her grandfather has been sick for years and has not spoken. The novel skips several years, and it seems that Saffron has accepted her life, although this is not the case as another injustice is coming her way. Her sister/cousin, Caddy, finds out from his nursing home that their grandfather has died. This shows how Saffron has felt out of place for years, and when she goes to mourn the loss of a relative that her family loves as much as she does, it almost makes her fit in. The last sentence in the paragraph renews your sympathy for Saffron. This makes you sympathetic to Saffron, but it was a little selfish anyway. Sarah’s mother thinks Saffron is a bad influence and is very angry when Sarah and Saffron both get nose studs, which Sarah pressures Saffron to do. Sarah formulates a plan so she and her parents go to Saffron’s hometown in Italy and she plans for Saffron to come too, which her mother is reluctant to allow after the nose stud incident, and blames Saffron for giving Sarah ideas. You feel sympathy for Saffron because it seems once again that she will not find her angel. This makes you feel sorry for Saffron as she thinks of her mother and her past life, which she barely remembers. There is no one at Saffron’s house, so they try going every day. On the last day Sarah and Saffron discuss how they can meet the people who live there, and Saffron suggests climbing over the wall. She decides against it, considering Sarah has a wheelchair. This shows that although she always feels lonely and you feel sympathy for her, Saffron also feels sympathy for other people as she knows how Sarah feels when she is left out, and Saffron’s situation has not made her a selfish person. When finally the two of them make contact with the woman who lives in Saffron’s house, they discover that Saffron’s grandfather came to buy the angel years earlier. You pity Saffron at this point, because it was difficult for her to make it to Italy, and when she finally gets there it turns out her angel is probably in England after all. Meanwhile in England, Saffron’s siblings/cousins are searching their house for her angel. They travel to their grandfather’s old house and find it, arriving home just in time to present it to Saffron. The stone angel is in many pieces because it hadn’t been taken very good care of. This shows how Saffron doesn’t mind that her angel is broken: she is just happy to have it and feel that she has a place in everyone’s lives. You feel sympathy for Saffron even now, as after all the trouble she went to her angel was smashed. 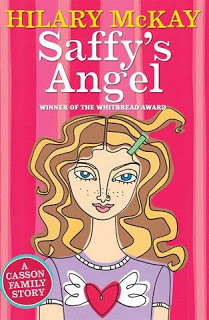 In conclusion, “Saffy’s Angel” by Hilary McKay is a novel in which you feel sympathetic towards the main character Saffron, because of the injustices she has to face discovering her mother’s death, her grandfather’s death, and her loneliness. She overcomes this by using her stone angel as a symbol of her mother and grandfather’s love for her, and coming to terms with her life. Lovely British children's book about a family of eccentrics. The mom is an absent-minded painter who named her children after paint colors, the hilariously insensitive father is nearly entirely absent, and the four kids are up to assorted hijinks involving keeping hamsters in pockets, stowing away to Italy, and searching for Saffron's inheritance, a missing stone angel. A plot description doesn't do it justice. McKay is one of those writers (mostly British, in my experience) who writes short, see Lovely British children's book about a family of eccentrics. The mom is an absent-minded painter who named her children after paint colors, the hilariously insensitive father is nearly entirely absent, and the four kids are up to assorted hijinks involving keeping hamsters in pockets, stowing away to Italy, and searching for Saffron's inheritance, a missing stone angel. I got into the story for Caddy and Michael, though - all conversations very well-rendered in audio form, "MICHAEL, DARLING!" "Don't call me darling, I am a driver instructor". That little note about how he needs to keep from looking at her as long as he can, because once he does, he can never quite concentrate as much on the instructing. And Droopy Di!! I would take a book that details their 99 driving lessons in detail. And once I was into the story, I got really into Saffron's quest. I liked her friendship with Sarah - I enjoyed Sarah's parents tremendously more, particularly her fountain-fixing father - and I felt for her, loved but still lonely. The whole Sienna trip was really enjoyable and I enjoyed the ultimate denouement. My daughters loved this book but I couldn't get over the father- who treated his wife with such condescension and belittled her art while escaping to the city so he can play the big artist. Also, I have a thing about stories about overly flaky artists. I don't like it. I find it annoying and propagates this myth that people who do art necessarily have to be flighty instead of hard-working, hard-thinking individuals who know how to pay bills and feed their children. Having said these very personal My daughters loved this book but I couldn't get over the father- who treated his wife with such condescension and belittled her art while escaping to the city so he can play the big artist. Also, I have a thing about stories about overly flaky artists. I don't like it. I find it annoying and propagates this myth that people who do art necessarily have to be flighty instead of hard-working, hard-thinking individuals who know how to pay bills and feed their children. BEST FAMILY EVER. Droopy Di. Michael the driving instructor. Sarah and her wheelchair and her parents in France! The siblings. The color chart that started it all. “She had to go,” said Rose. “It was because of her angel,” said Indigo. “And because of Granddad,” added Caddy. Reviewed more in depth here at the YA/MG book battle. I plan on reading the rest of the books in this series BEST FAMILY EVER. Droopy Di. Michael the driving instructor. Sarah and her wheelchair and her parents in France! The siblings. The color chart that started it all. This review has been hidden because it contains spoilers. To view it, click here. I would have given this book a five... but for a few things. First of all, that Saffy's adoption was a secret. Do you guys know how ridiculous that is? The idea of not telling my little sister she's adopted is sheer dumbness. Secondly, her father was an idiot. End of story. Quite a stupid person. And Sarah irritated me a lot. Not to say the book was bad at all. The writing I thought was beautiful, the siblings were really funny and sweet, Cadmium made me laugh a lot, and I loved Rose and Indigo. I would have given this book a five... but for a few things. First of all, that Saffy's adoption was a secret. Do you guys know how ridiculous that is? The idea of not telling my little sister she's adopted is sheer dumbness. Secondly, her father was an idiot. End of story. Quite a stupid person. And Sarah irritated me a lot. This was CHARMING. It reminded me of the older children's books I read as a kid. I laughed my way through the last few chapters and the ending was WONDERFUL. I really enjoyed this book. From the cover it originally seems like a girly teen book but I actually found it very moving at times. I also loved that every character has their own story which adds to the whole plot. Ohhhh. That was far less sweet, and far more wonderful, than I was expecting. How did it take me so long to finally read this? This book was recommended to me by a friend. It was one of those moments when I judged a book by the cover. However my judgement was wrong. I really enjoyed it and would recommend it. Reminded me quite a bit of the Penderwick books, but of course British and not quite so modern. Very similar feel, though, and I look forward to reading the rest of the series (like with the Penderwick books, I suspect the youngest girl will be my favourite). This book is about a family and their respective lives. Also when Saffy discovered quite by accident that she has been adopted as she is deeply upset though the other assured her that it makes no difference at all. Saffy is the daughter of Eve twin sister who lived in Sienna Italy and died in a car crash. Grand dad Taffy as a very small child back from Sienma. Granddad's death he leave something to each of the children. To saffy it is "her angel" although no one knows its identity. How Saffy dis This book is about a family and their respective lives. Also when Saffy discovered quite by accident that she has been adopted as she is deeply upset though the other assured her that it makes no difference at all. Saffy is the daughter of Eve twin sister who lived in Sienna Italy and died in a car crash. Grand dad Taffy as a very small child back from Sienma. Granddad's death he leave something to each of the children. To saffy it is "her angel" although no one knows its identity. How Saffy discovers what her angel is with the help of an energetic new friend lies at the heart of his enchanting story. Unforgettable characters come alive and often deeply humorous and always observing events to be treasured for a long long time The genre of this book is family, Humorous. The part that grabbed my attention was when Saffy's discovers quite by accident that she has been adopted she's deeply upset though the other assure her that it makes no difference at all . finds out that her mom died and that she is actually living with her aunt. She starts to feel alone. Saffy meet Sarah and they become best friends. Taffy's Grandpa died he was the only one she felt connected to. Her Grandpa gave her an angel and she lost it and wants to find it but doesn't know where it could be. Sarah her best friend helps her think of where it could be and realizes it could be in Sienna Italy where Saffy was born. Saffy and Sarah goes to Sienna but don't find. At Saffy's home her cousins are looking for the angel too. Then the oldest cousin Caddy realises it could be in the whales were their Grandpa lived. Her three cousins set off to Wales and find the concrete angel but it was all shattered. So she is grateful they found it and realizes that it doesn't matter if it was broken all that mattered was that she had a piece of her Grandpa to hold on to. Caddy glues the angel back together and gives it to saffy. Then days later on Saffy becomes closer to her family. 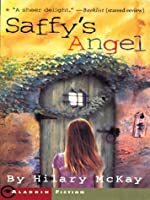 The title really goes with the story because "saffy's angel" means that the angel that her Grandpa gave her made her get closer with her family. The mayor event was she lost her angel try to find it she found it which made Saffy change and get closer with her family and express herself around her family. Another theme that recurs to the book is to learn to accept people's differences and not judge them based on their disabilities also to respect your elders. I thought this book was very well written at the end of the chapter I just wanted the story to keep on going. I liked it because it showed how important family is there was a lot of action and adventure in this book. I think it's just a nice book that will inspire you. Based on the covers of any of these editions you'd be forgiven for mistaking the title for "Sappy's Angel". They're all rather precious. The title itself was a bit off-putting for me: I was afraid it was going to being something cloyingly religious, with perhaps, a good lesson about character through suffering. Not hardly. Thankfully, the book it most reminds me of is The Penderwicks: A Summer Tale of Four Sisters, Two Rabbits, and a Very Interesting Boy. * Both are stories about four siblings, with one old enough for crushes, and one quite young. Both have an old-fashioned episodic style, although the characters themselves are quite modern, secular, and eccentric. Both have loving but distracted parents who largely leave the kids up to their own devices because they have their own things to do. Both have intimidating rich women. Both are about the importance of family who are actually loving, if negligent in appearances. This one has a herd of guinea pigs in lieu of Hound, and lots and lots of art as craft and career, which is interesting and in keeping with the overall bohemian feel. And I'm sure it doesn't tell you anything about me that the mother is a crappy cook. *Saffy's Angel is several years the elder, but alas, I came to it later. Could I live in the Casson house? Absolutely not. Could I enjoy an extended stay? Absolutely not. Would I enjoy an afternoon visit? Maybe. Visiting them through the pages of their story is my ideal. That way I am not literally experiencing the mess or chaos. Saffy and the search for her angel are certainly the core of the book but the heart of the story is all the Casson children. Saffy is distant and temperamental but obviously loves her quirky siblings very much. C Review originally poster here. Saffy and the search for her angel are certainly the core of the book but the heart of the story is all the Casson children. Saffy is distant and temperamental but obviously loves her quirky siblings very much. Caddie, Indigo, and Rose are devoted to her and to each other. The way they understand each other and assist each other amid such chaos and despite their idiosyncrasies is heartwarming. The senior Cassons on the other hand...If I read this as a child I might have found them to be just different, and kind of quirky, like the kids. As an adult I just want to find them a therapist. This made me feel even more attached to the kids. I want to bake them cookies and let them play at my house (provided they leave their rodents and paints at home-they probably wouldn't enjoy it here). Which I guess makes me Mrs Warbeck (a character in this book I found delightful and often misunderstood). My copy of Saffy's Angel has been read through so many times that by now, the spine has become floppy and the corners are well-worn and curling upward. It's difficult to say why exactly I love this book. It could be the charming Casson family and their outrageous friends who seem both realistic and yet too good to be true. It might be Mckay's simplistic writing style which is neither too formal or too "easy". But mostly, what I think does it for me is Mckay's vivid imagery. Anyone can write a st My copy of Saffy's Angel has been read through so many times that by now, the spine has become floppy and the corners are well-worn and curling upward. It's difficult to say why exactly I love this book. It could be the charming Casson family and their outrageous friends who seem both realistic and yet too good to be true. It might be Mckay's simplistic writing style which is neither too formal or too "easy". But mostly, what I think does it for me is Mckay's vivid imagery. Anyone can write a story about a girl who stows away with her friend to Italy to find her true origins after realizing she's adopted (okay, not everyone, but you get the idea) . However, Mckay's descriptions is what makes this story this story so lovely. They seem to flow smoothly, always getting the idea across so that the reader can visualize what she's talking about clearly, but never quite coming off as too technical or pretentious. If you haven't met Hilary McKay's enchanting Casson family, then make sure you remedy this omission! Their parents are painters- Bill, their father is a successful and acclaimed artist, living and working in London; Eve, their mother, make ends meet by painting popular subjects and teaching art classes. The children- Caddy, Indigo, Saffron and Rose- get by as best they can in their loving but slightly chaotic home. Saffron is the focus of this book. She discovers at the age of 8 that she is the a If you haven't met Hilary McKay's enchanting Casson family, then make sure you remedy this omission! Their parents are painters- Bill, their father is a successful and acclaimed artist, living and working in London; Eve, their mother, make ends meet by painting popular subjects and teaching art classes. The children- Caddy, Indigo, Saffron and Rose- get by as best they can in their loving but slightly chaotic home. Saffron is the focus of this book. She discovers at the age of 8 that she is the adopted child of Eve's sister who died when Saffron was a toddler. A note in the children's grandfather's will leads Saffron, her new friend, wheelchair user Sarah, and her adopted siblings, on a journey to discover Saffron's past and her place in her family. I'm really amazed that there's something out there that captures the spirit of Dodie Smith's I Capture the Castle plus all those interlaced family novels I read as a kid (though I'm blanking on any titles, but I guess somewhere between All of a Kind Family and Little Women), and doesn't sacrifice the modern world. There are mobile phones! It's not trapped in some ridiculous past masquerading as the present--it is thoroughly the present. But it has a pleasant sensibility of another time. The Casso I'm really amazed that there's something out there that captures the spirit of Dodie Smith's I Capture the Castle plus all those interlaced family novels I read as a kid (though I'm blanking on any titles, but I guess somewhere between All of a Kind Family and Little Women), and doesn't sacrifice the modern world. There are mobile phones! It's not trapped in some ridiculous past masquerading as the present--it is thoroughly the present. But it has a pleasant sensibility of another time. This review has been hidden because it contains spoilers. To view it, click here. Saffy meets Sarah, a girl with a wheelchair, who is determined to help her find her angel. Saffron even becomes a stowaway in Sarah's beanbag, as they travel together to Siena, Italy, the place of Saffy's birth. Saffy's siblings go to their grandfather's old house and find Saffy's angel. However, when they open the box with Saffy's angel they find it broken in many pieces. Eventually, Saffy gets her angel (pieced together by Caddy, Indigo and Rose). I fell in love with Saffy's delightful, goofy family. I hope there are more books about them. It's a book positively infused with gentleness, a bemused goodwill, and love. So much love on every page. No surprises, no tears. I left it in the observation car on the train and was happy to see a young girl engrossed in it the very next day. A sheer delight. What a perfectly delightful book. I'm totally hooked on the Casson family now and so glad to see there are more books about them! I laughed so hard while I read this-the characters are irresistible. Reading about this sweet, eccentric English family was a real treat. re-read it and it seemed a little slow in the beginning, but then became so charming that it was every bit as good as I remembered. “I can only drive slowly." "And I can only do left turns."